Veracruz may not say much to some of you outside of Mexico, but at least know that Veracruz is one of the main ports in Mexico and it is located in the Gulf of Mexico. I have eaten several things in Veracruz before. There are traditional and local foods people should try, but this time I want to talk outside the popular local dishes. There were three particular restaurants that became the topic of several conversations I had with my friends and family. Even a month after I’m still talking about them! 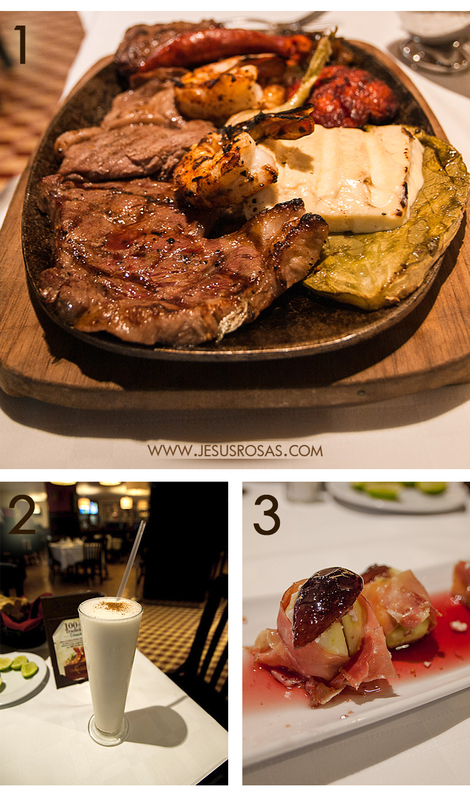 I will tell you (and show you) what I ate in each of those particular restaurants, but first I’ll say something about some other restaurants and meals I also had in Veracruz. I will leave the best at the end. If you want to skip the so-so and negative reviews, go directly to the half of this post and read about the best. First the ordinary (at least to me). Los Giros is a franchise. They sell mostly tacos. I asked for alambres al pastor with cheese and pineapple. Alambres is a well known dish in Mexico. It is meat cut in strips, usually with green peppers and onions; if you ask for alambres al pastor then you get pork meat cooked on a vertical rotisserie. The meat would have been previously marinated with some chili peppers and spices and, the best ones, with achiote (a shrub used as condiment) and/or orange juice. So I got this dish and a glass of horchata. The dish at Los Giros restaurant was okay, really nothing memorable. The meat wasn’t the best quality and it was chopped too much. See the picture below. Alambres al pastor con queso at Los Giros on Ávila Camacho Boulevard in Boca del Río. El Portón is also another franchise. They were owned by Wal-Mart and now they are part of ALSEA. El Portón offers many popular Mexican dishes and some other options, but really nothing out of this world in terms of taste and quality. You can think of another VIPS or Samborns restaurant in Mexico. If you want something casual, standard, clean, and pay a decent price then El Portón is the place. They also accept credit cards and they have a menu you can see online. 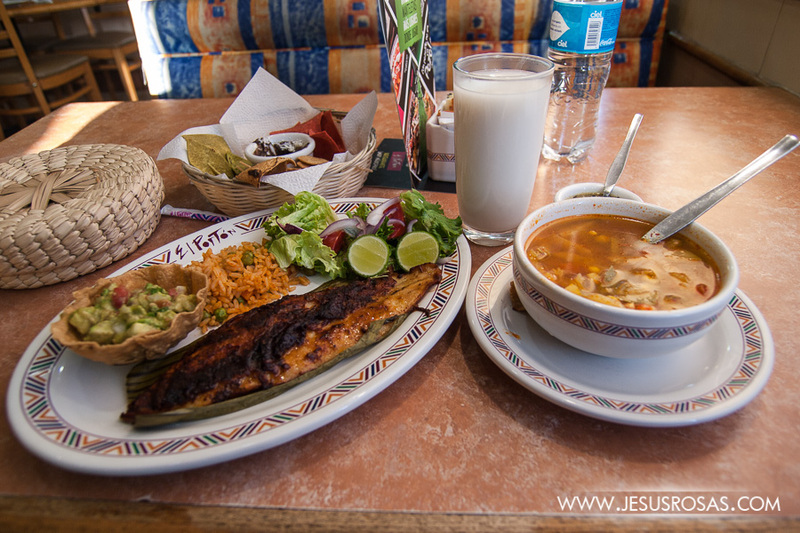 I ordered pescado al chipotle (fish chipotle style), a corn and vegetable soup, and an horchata drink for MXN 109.00 (about USD 7.00*). 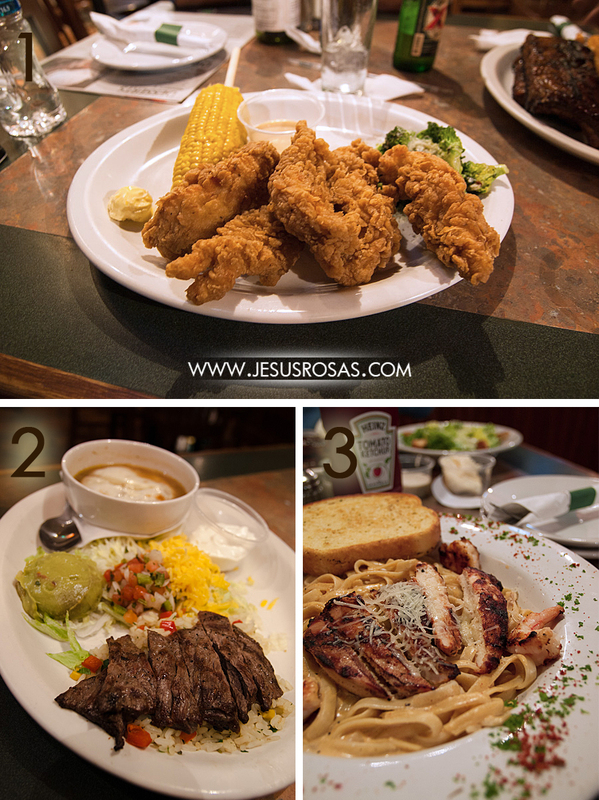 You can eat better and for half the price in some more informal dining places with the daily menu. The fish was slightly soggy and had too much chipotle. Vegetables soup, horchata drink, and fish chipotle style. The fish slightly soggy and had too much chipotle. Bennigan’s is another franchise from the US described as a casual restaurant and Irish pub. It is interesting mentioning that they don’t have franchises in Ireland, or other countries in Europe, and they are in less than 10 countries. The US and South Korea have more than 20 Bennigan’s each then Mexico with five and Cyprus with four. Three out of the five Beniggan’s in Mexico are located in Veracruz. Bennigan’s was okay, some dishes are better than others. I went there a few times because that was the option of those who ate with me. Did they like it that much? They said it was mostly because of its location. In the pictures below you can see what I ate. Picture 1 shows chicken strips with honey sauce and Dijon mustard. Picture 2, arrachera fajitas on top of pilaf rice, guacamole, Colby cheese, and onion soup. Picture 3, shrimps and chicken Cajun style on top of fettuccine with vegetables and accompanied by garlic bread. The latter was the dish I enjoyed the most, but only the first time I ordered. The second time I had it, the chicken was too dry and overall a little saltier. 1. Chicken strips with honey sauce and Dijon mustard. 2. Arrachera fajitas on top of pilaf rice, guacamole, Colby cheese, and onion soup. 3. Shrimps and chicken Cajun style on top of fettuccine with vegetables and accompanied by garlic bread. I also went to a Brazilian style restaurant. They bring to your table different types of meat. First I was given a mushroom soup and melted Gouda cheese. There was also a salads and pasta bar, I was recommended to visit it first before getting any meat. Of course they would like that to save meat and fill your stomach with pasta. Either way, I wanted to eat some salad and pasta. I didn’t find anything really interesting. The only new thing to me was the habanero sauce with strawberries, but not better than the better known habanero and mango sauce, for example. After I finished with the pasta and salads, the waiters started coming with different meat skewers. I didn’t take pictures of all these meats, sorry. The best one for me that day was picanha which is Brazilian cut of beef that in English could be known as rump cap. See number eight for picanha. Image from Wikipedia. Sorry for the pictures quality. I took them with my phone. 1. Mushroom soup and the melted Gouda cheese. 2. Tuna salad with apples and cheese. 3. Plain spaghetti, mushrooms with onions and cheese cubes. 4. Chicken breast with green pepper and a variety of sausages. 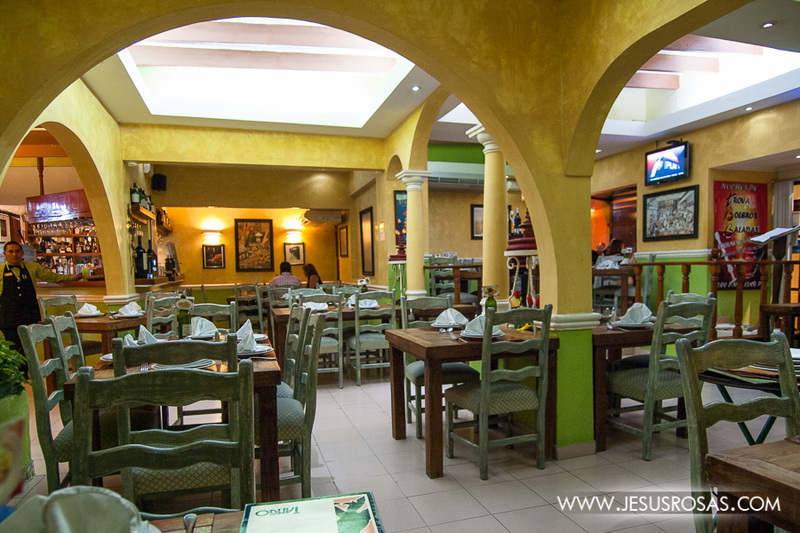 Gran Café de la Parroquia is by far the most well known coffee shop and restaurant in all Veracruz. You can ask everyone about a place to eat and all locals will tell you that you have to go there. It is part of a long tradition since 1808. Many politicians, journalists, and other celebrities from different decades have been going there. Today it is a franchise and you can find them in several places around Veracruz. Despite all that my experience in Gran Café de la Parroquia wasn’t really that big of a deal. Yes, I liked it, and the service was good, but nothing out of this world. I ordered the enchiladas especiales parroquia. It had turkey, manchego cheese (Mexican version), and a red sauce. The tortillas were very soft and they broke easily with the fork and in the mouth; a version of enchiladas I hadn’t tried before. Medium hot, maybe less (for Mexican standards). They arrived in less than 10 minutes. I didn’t ask for anything to drink, but the waiter brought a glass of water without me requesting it. Nice touch. I paid MXN 56.00 (less than USD 4.00*) for the enchiladas. I would go back and try other dishes. 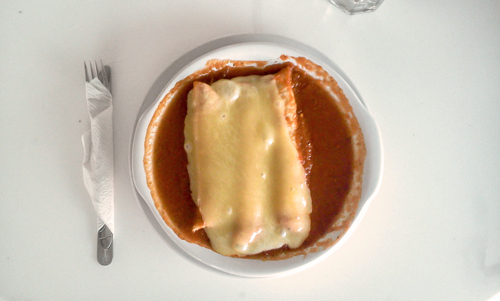 Enchiladas especiales parroquia. Filled with turkey and covered in Mexican manchego cheese in a red sauce. Fiesta Inn had a large all-you-can-eat breakfast buffet for MXN 215.00 (little less than USD 14.00*). One of the best breakfast buffets I have seen in many executive hotels in Mexico. The problem is that you can bypass the good options. Some of the best things are hidden, need to be combined, or need to be asked for. So if you don’t know much about dishes, you may miss the best. There is for example someone in a bar with a large stove cooking in front of you whatever you ask for that is in the counter. In other counters you can find eggs, meat dishes, vegetarian dishes, fresh fruit juices (even green juice with pineapple and nopal), different types of yogurt, cereal, desserts, salads, fruits, bread, pan cakes, waffles, toasts, and local cuisine such as atole, tamales, chilaquiles, pozole and a lot more. The downside was that the menu wasn’t really interesting outside of the breakfast buffet; they had some pasta and meat, but if you are going to have pasta or meat, you can always look for a better place. Unfortunately my pictures didn’t turn out that great. I only have one decent picture below. 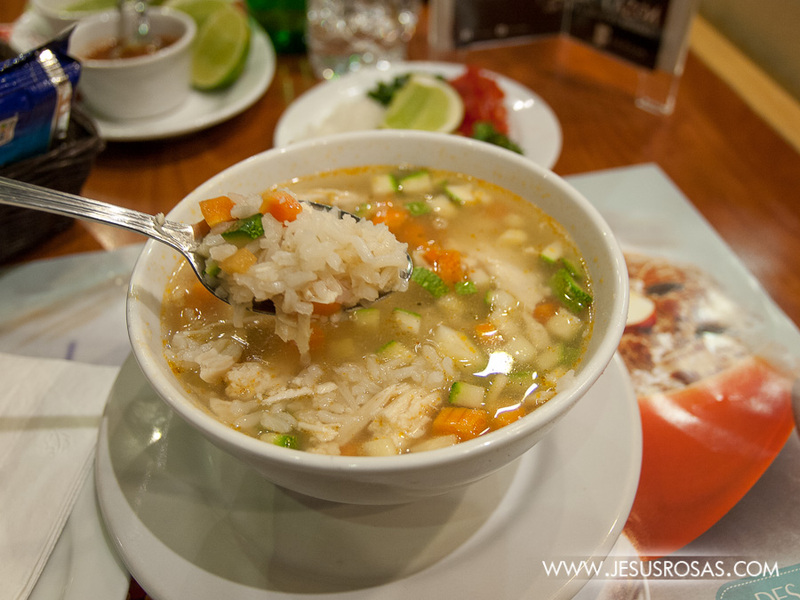 Sopa Xóchitl. Chicken breast with vegetables, rice, and avocado. One night two colleagues and I would meet at Che Tango restaurant. Two of us arrived early and entered, we found a colorful decoration. I liked the arches and bright yellow inside. It looked promising until I noticed cigarette smoke. A couple of people from a particular table were smoking inside the restaurant. It supposed to be a non-smoking area. I don’t smoke and I’m very sensitive to cigarette smoke. I mentioned that to the waiter, but he didn’t seem confident enough to manage the situation. He still approached the smokers and asked them to turn their cigarettes off, but he was completely ignored. We still hadn’t ordered anything because we were waiting for one more person, and since I was having a hard time with the smoke, I politely told the waiter that we would leave. He seemed disappointed and stressed, he really didn’t want us to leave so he asked if we would accept moving to the smoking room which paradoxically there wasn’t any smoke. It was an empty room. Although the other people should have moved, I still accepted it because I really wanted to try that restaurant. We moved and although not as bad as before, few minutes later I started to feel cigarette smoke coming in because the waiters left the door open several times. 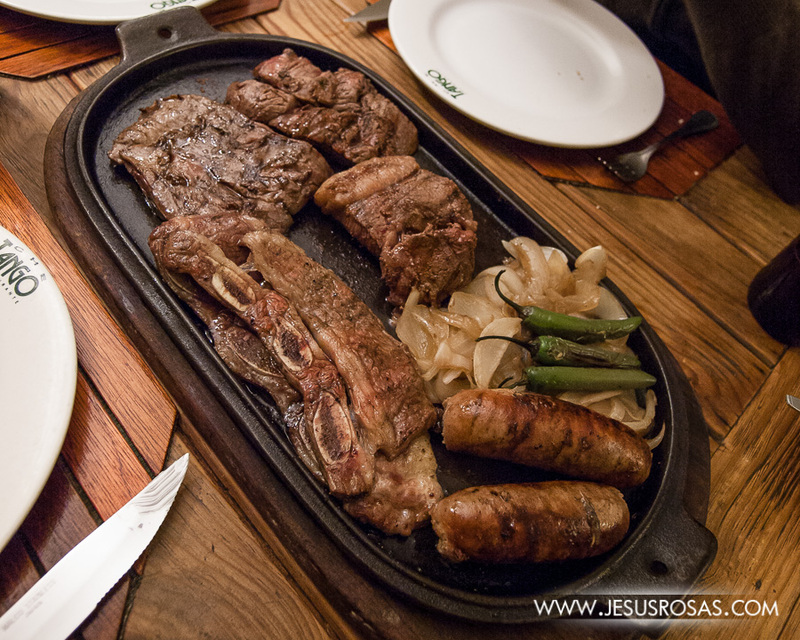 We ordered the Parrillada Tango, which was a mix of arrachera, ribs, sausage, another type of meat that I can’t remember and some onion. The meat wasn’t particularly great. We had asked for well done temperature meat and they brought it medium rare and even rare. I had my stomach rumbling and working hard that night; I woke up in the middle of the night feeling horrible. The decoration was bright and colorful. I liked the arches at Che Tango restaurant. This was our parrillada for two people. Our last day in Veracruz, a friend and I decided to go to Italianni’s. I must admit that I’m not a big fan of Italianni’s either. If I had to choose an Italian food franchise restaurant, I would prefer Macaroni Grill or even Olive Garden, but he seemed very excited about it and I wanted him to have a nice experience. So we went there. I had the Insalata di Mela (a mix of lettuce with Italian vinegar, green apple, dried cranberries, caramelized pecans and goat cheese in ash). The plate was too small for the salad that I had to eat it carefully so I wouldn’t drop my salad on the table. The vinegar killed the pecans. The apple, cheese and vinegar dominated all flavors. I also ordered the Pesce Pinoli (fish with broccoli in roasted almonds and pine nuts with lime). The salt and lime were the prevalent flavors. The pine nuts and almonds gave texture to the dish. 1. Insalata di Mela (a mix of lettuce with Italian vinegar, green apple, dried cranberries, caramelized pecans and goat cheese in ash). 2. Pesce Pinoli (Fish with broccoli in roasted almonds and pine nuts with lime). 3. Piña colada (without alcohol). 4. A snapshot of the restaurant. Los Canarios was above the average. This was a better experience, at least regarding the food and service. It is two blocks west from the Torre de Pémex. 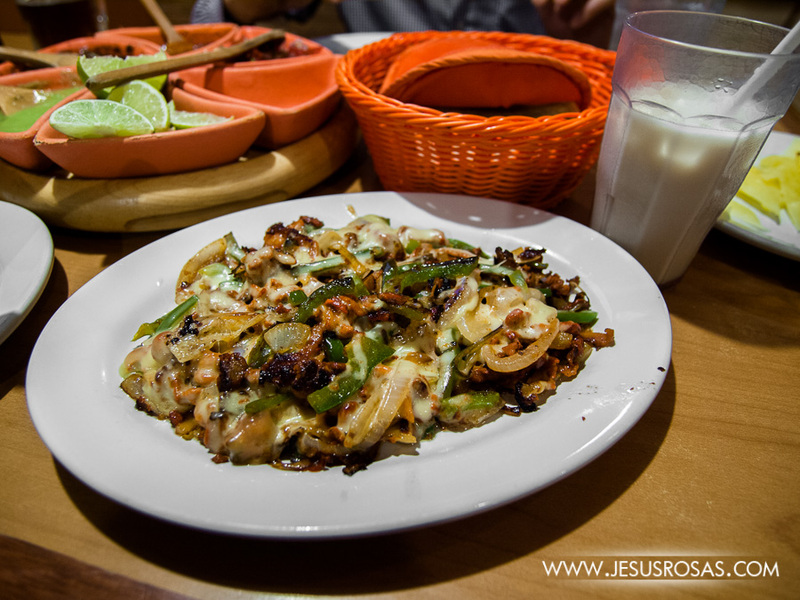 The parrillada had some types of meat, shrimp, chistorra, and cheese on top of a piece of nopal. The chistorra in the parrillada was probably the best. I got stuffed figs with goat cheese wrapped in Serrano ham. In my opinion too sweet, it felt more like a dessert. The service was also good, the waiters didn’t interrupt much. They were far from us, but visible and ready in case we needed them. I would come back here only for that chistorra. 1. Parrillada mixta with several types of meat, some shrimp, and cheese on top of a piece of nopal. 2. Piña colada (without alcohol). 3. Stuffed figs with goat cheese and wrapped in Serrano ham. And things start getting more interesting from here on. On my first day in Veracruz, I was taken to El Gaucho, which is owned by David “Che” Siles, an Argentinian and former professional football (soccer) player who now lives in Veracruz. The restaurant didn’t seem that impressive. But being there turned out to be one of the best food experiences for me in Veracruz. The service was okay, but the food was really good. The bread they gave us to wait for our dishes was really soft and warm, and the outside was slightly crunchy. We all got bife de chorizo, which has nothing to do with chorizo or sausages. 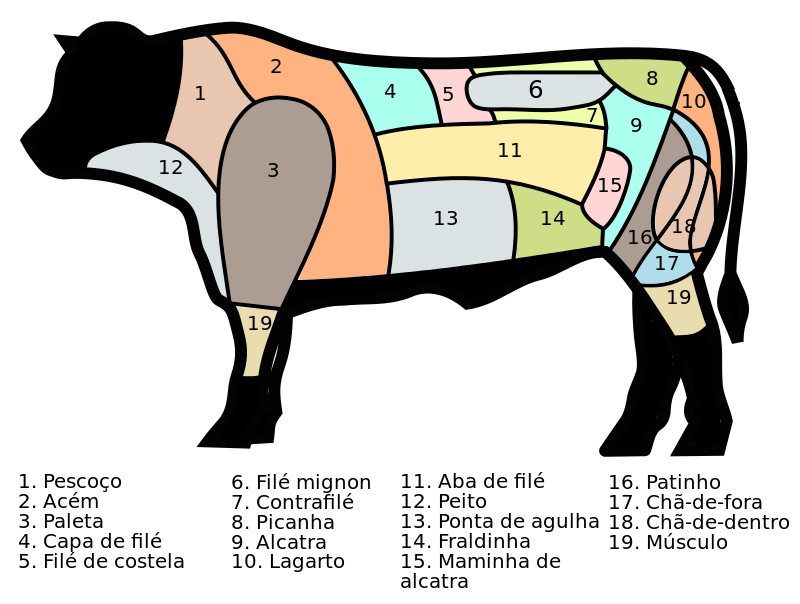 Bife de chorizo is a type of cut, which seems to be known as entrecôte or New York strip, others would associate it with names such as top loin, sirloin steak, and strip steak. The meat was surprisingly exquisite. One of the best I have eaten in a while. But what made it even more interesting is the sauce they had on the table. Do you like chorizo? You know that chorizo is some sort of ground meat with spices, right? Well, imagine you take those spices and flavors and add it to your sirloin steak. What do you get? You get the flavor of a fine Argentinian chorizo with the texture of a juicy sirloin steak. It was unbelievable! Sorry for the pictures quality. I took them with my phone. 1. Salad (lettuce wasn’t that crunchy) and bread (soft and warm). 2. Bife de chorizo with a baked potato covered with cheese. Another great night in Veracruz, we went to an Italian restaurant with great decorations. Paintings, plants, water, indoor and outdoor tables, soft light, it all made it feel cozy. The hostess took us to our table and then a man dressed in Venetian gondolier clothes (minus the hat) introduced himself as Fernando, our waiter, and handed out the menu. After looking at it, I had an idea of what I wanted, but I asked the waiter first what was his best recommendation. He suggested the shrimp and potato ravioli in mandarin thin sauce. I was happy to hear that, it was exactly what I had in mind so I ordered it and it was good. I would probably take the potatoes out because it gives a mushy texture, but the flavor was great. I ended up using my spoon to finish all that mandarin sauce. After eating we felt still hungry. So my friend and I asked for two pizzas, each one had two kinds. So in total we got four kinds of pizza. Pizza arlequino (aromatic basil, pesto sauce, fresh salmon, thin slices of apple and vanilla cream cheese), pizza la veracruzana (shrimp and fresh pineapple), pizza 4 stagioni (salami, mushrooms, leg ham, and bell pepper), and pizza 4 formaggi (mozzarella, Gruyere, Roquefort, and Provolone cheese). Not bad, new combinations most of them and I liked them a lot. 1. Pizza arlequino (aromatic basil, pesto sauce, fresh salmon, thin slices of apple and vanilla cream cheese) and pizza la veracruzana (shrimp and fresh pineapple). 2. Raviolis stuffed with shrimp and potatoes on top of a thin mandarin sauce. 3. A snapshot of one side of the restaurant and our waiter. Emilio is another great restaurant. It is a house and it feels a little crammed, but with a sort of cosmopolitan decoration in which white dominates. There are large black and white photographs on some walls and some table clothes are white. It feels classy. The service wasn’t great really, they were slow, and we had to wait for a while before ordering the bill. But the food, oh, that was good. We had some cheese with shrimp, almonds, tomatoes, lettuce and balsamic vinegar. I ordered pescado a la veracruzana (Veracruz style fish) with shrimp. It was a good thick piece of fish topped with shrimp and Veracruz style sauce, which is made of tomatoes, onions, garlic, olives, caper, chiles, and herbs. Then I tried a spinach, mozzarella and goat cheese pizza. It had a slightly strong flavor, but good. The bread was soft and the edges slightly crunchy. I really liked the variety of meals and the presentation. They did a good job in each plate they brought to us. If you want to give it a try, here is the restaurant address. Although they don’t have a website, their Facebook page shows the daily menu. 1. Cheese with shrimp, almonds, tomatoes, lettuce and balsamic vinegar. 2. Spinach, mozzarella, and goat cheese pizza. 3. Veracruz style fish with shrimp. This is my number two favorite place to eat in Veracruz. Actually not so much the place, but their pizza. It was different, really different than what I eat in other places. From the outside at night the restaurant looked to me like another ordinary and low-budget pizza place in a not so fascinating residential neighborhood. I also thought it would be more like a place for backpackers, hippies and youngsters. Nothing wrong with that, but that was the impression it gave me. A sign offering two pizzas at the price of one caught my attention. “It must be a cheap place to eat”, I thought. I noticed the narrow stairs to the second floor where the restaurant was located. Once inside, the tables were nicely set with tablecloths, fabric napkins, and goblets. I saw some young and older people well dressed in some of the very few tables I saw inside. The pizza was being made in a brick oven in the balcony next to some other tables. Then I asked for the sizes of the pizzas, and just as I thought, they weren’t that big, but still not that bad for the price. I checked the menu and I was immediately intrigued by one of the pizzas: the Dolce Vitta pizza. Instead of tomato sauce, it was made with onion sauce. It had apple, caramelized pecans, mozzarella, provolone, and parmesan cheese. You probably have noticed that I like sweet and salty meals. Things with fruits and nuts mixed in meals sound great to me. I also ordered the Luxor Formaggi pizza to take out. The later was made with six different types of cheese! They were cheese cream, blue cheese, Mozzarella fresh and pizza style, provolone, and parmesan cheese on mascarpone sauce. I was impressed. The bread was about 1 cm thick and soft and the edges were ornamented. The presentation was unexpectedly excellent. 1, 2, and 3. Dolce Vitta pizza made with onion sauce, apple, caramelized pecans, mozzarella, provolone, and parmesan cheese. 4. Luxor Formaggi Pizza made with cheese cream, blue cheese, Mozzarella fresh and pizza style, provolone, and parmesan cheese on mascarpone sauce. And ladies and gentlemen, the best of all was Fusión. First let me tell you, my friend and I arrived by taxi. We had a large denomination bill (MXN 500.00) and the taxi driver didn’t have any change. I approached the valet parking guy at the entrance of Fusión restaurant. Perhaps he or someone inside would have some change. But as soon as I explained the situation to one of the waiters who was also there, he said that he would take care of the taxi and add it to our bill. Very first and nice impression. The restaurant looked like a Caribbean-style house, it is made out of wood with a pitched roof and painted in a colorful blue. We got in and the indoor decoration caught my attention. A wooden vintage house with wine bottles and candles, old paintings, and artifacts around contrasted the modern plates and dishes, and waiters’ and customer’s clothes. It was also a small place, perhaps no more than 12 tables, but a very nice place to be. The distinctive menu format listed several original recipes. I wanted to try them all, but I could only try three dishes. Ready? I ordered the Salmón Fussion (MXN 225.00 / almost USD 15.00*), which is a slice of salmon from the Atlantic covered with baked almonds and pistachios on top of mango chutney and white rice. The salmon was thick but soft and cooked right. Having a piece of salmon and then mix it with the mango and pistachios was heavenly. I hadn’t eaten something similar before and it was undoubtedly an exquisite experience. We also had the Queso frito al tamarindo (MXN 75.00 / almost USD 5.00*), which was breaded Oaxaca-style cheese with tamarind sauce, potato flakes, sesame seeds and cilantro. I didn’t know, but the tamarind had a touch of mezcal. Fortunately for me, it wasn’t enough to feel more than a light scent. That cheese was also incredibly good. The potatoes and cilantro didn’t get on the way, it was cheese with tamarind what dominated the flavors. Great crunchy texture in the outside with a soft inside. My friend asked for the Picadas de camarón y mole (MXN 65 / around USD 4.00*). They were some sort of small but thick handmade tortillas topped lard, shrimp, mole (a Mexican chocolate and spicy sauce) and fresh cream. I like all these ingredients, but combined all together don’t make it to my favorite top recipes. I just don’t enjoy mole and shrimp together. Some people may like it. Regarding the service, it was great. Waiters weren’t intrusive. They hardly interrupted, except to offer another drink to my friend and to offer dessert at the end. However, most of the time they were nearby the counter looking at all tables in case someone needed something. This restaurant deserves the top ratings and it is now one of my favorite places to eat. 1. Queso frito al tamarindo, which was breaded Oaxaca-style cheese with tamarind sauce, potato flakes, sesame seeds and cilantro. 2. Picadas de camarón y mole. Small but thick handmade tortillas topped with lard, shrimp, mole, and fresh cream. 3. Salmón Fussion, which is a slice of salmon from the Atlantic covered with baked almonds and pistachios on top of mango chutney and white rice. 4, 5. Snapshots of the restaurant. Notice the decoration, walls, and roof. You may want to read about my favorite Chinese dish. And there you go, that was my amazing experience eating in Veracruz. 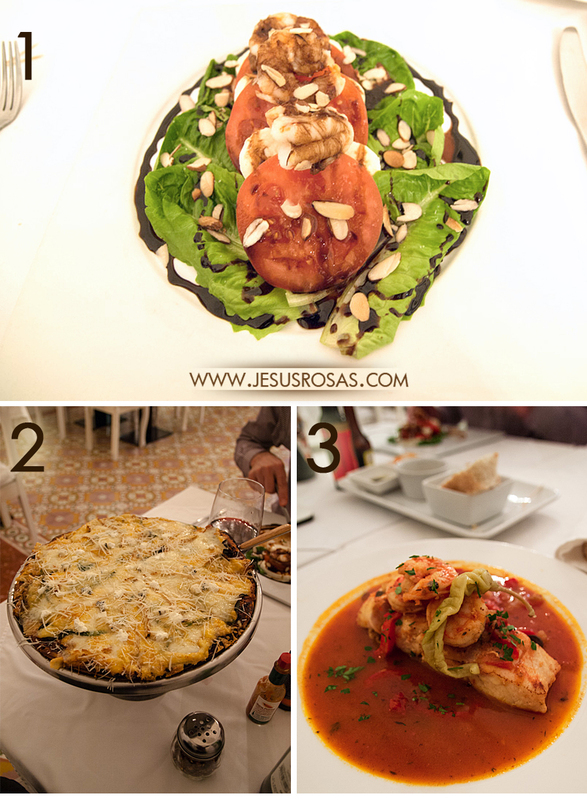 But to all my friends in Veracruz or those who have been there, do you have a favorite restaurant? Any particular dish? I would like to know your opinion so I can go there my next time I go to Veracruz. Leave your recommendations in the comments section below! *MXN currency to USD currency conversion on March 17, 2015.